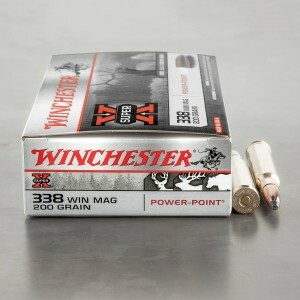 Winchester introduced .338 Winchester Magnum ammo in 1958 to fill the performance gap between the various .300 magnums and the .375 H&H Magnum. The round itself is a .34 caliber, bottlenecked, belted magnum, rifle cartridge. 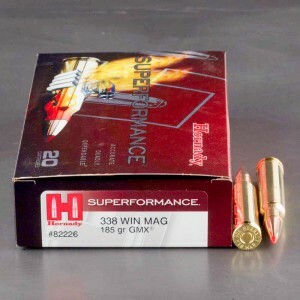 Because 338 Win Mag functions in standard length actions, it is chambered in rifles by most firearms manufacturers. Also, because it was specifically intended for use on the largest North American game species, it is an effective cartridge for hunting both Brown Bear and Moose and, has even become a favored, long range, Elk hunting cartridge. 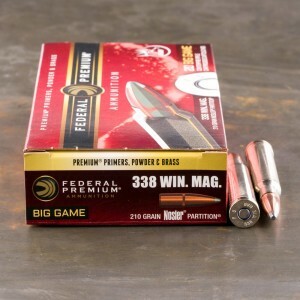 However, due to the fact that bullet weights generally range from 200 grain to 300 grain and feature a wide range of bullet types from soft point spitzers to monolithic solids, with the right load, this cartridge is easily capable of taking down even the largest of the African Plains game species in locations where this caliber is allowed. 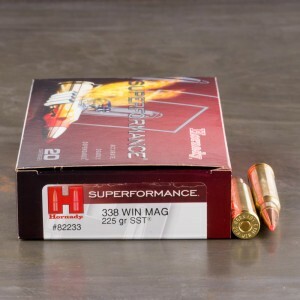 338 Win Mag ammo delivers a muzzle velocity of 2,800 feet per second, a 225 grain bullet generates over 3,900 foot pounds of muzzle energy and a 275 grain bullet moving at 2,600 feet per second generates over 4,000 foot pounds! However, it should be noted that the accompanying recoil this cartridge generates is significant and thus, it may be more gun than shooters with smaller frames can withstand. 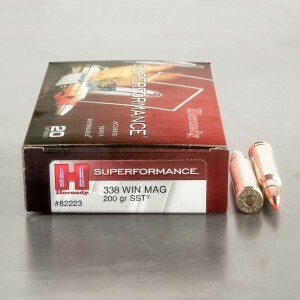 Consequently, this cartridge should be reserved for use on the largest of North American game species where one of the various .300 Magnums would provide only marginal performance or, for cases where superior downrange retained energy is needed for deep penetration on long range shots. Very consistent shooting round with devastating power. I best 338 Win Mag round I've shot so far with my rifle. Shoots like I expect it to, 5 shots within 2" at 100. Most of that is me, the rifle is a LOT more accurate. It is a little expensive (only one above and one more equal) but it is also the only brand running 210 gr Nosler Partitions which at what dad used to put in the handloads. 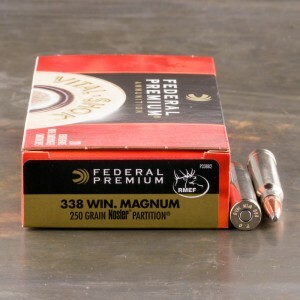 I could go to a larger bullet but since I would still want the Partitions that would mean stepping to a 250 gr bullet and only saving $5 per box. I know what the Partitions do and know what results to expect. I have tried other bullets in the past and not been happy with the results. Have to pay for quality.